The Zyuohgers are looking around the city for the missing King’s Mark. 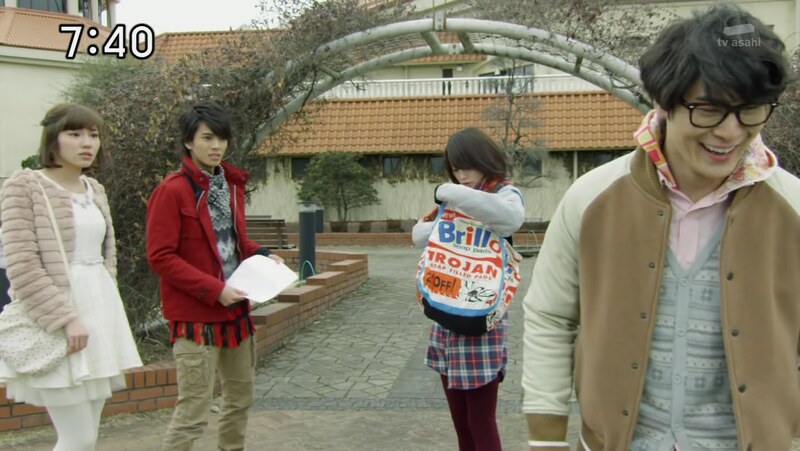 Yamato is handing out flyers in the plaza, Sela is looking in the water while Leo and Tusk are at the junk yard. Amu, meanwhile, is distracted by the pretty things in the store. 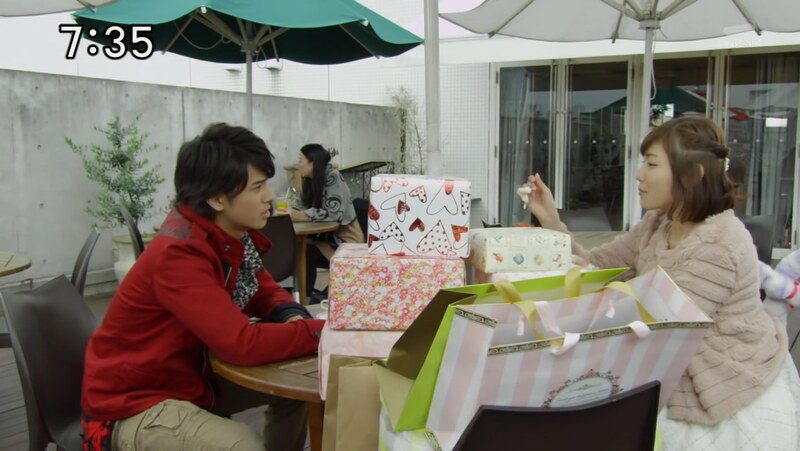 She tricks Yamato into go on a shopping spree with her, with Yamato paying for everything of course. 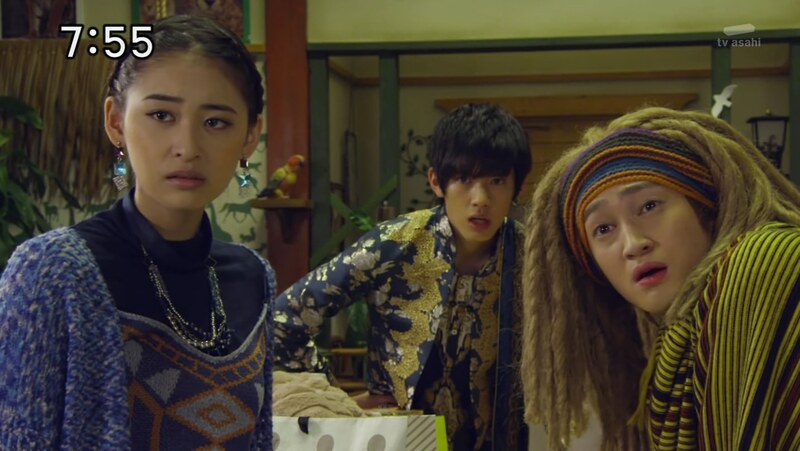 Yamato realizes Amu is not seriously looking and asks if she really wants to return to Zyuland. Amu basically says it’s hopeless. Yamato is surprised Amu feels this way since she’s always smiled and seemed happy. Suddenly, his vision goes blurry before it zooms in on a couple holding a cube! The King’s Mark! He tells Amu, but she can’t see it since it’s so far away. Elsewhere, Bowguns is the next player in the Blood Game as he attacks vehicles on the road. Sela, Leo and Tusk’s tails alert them to the disturbance and they hurry over, henshin and take on the Deathgalien. But Bowguns is able to escape. Sela, Leo and Tusk wonder where Amu and Yamato are, but they go after Bowguns in the meantime. Up on the ship, Cubaru is annoyed at Azarudo taking his turn. But Nalia reminds them that it doesn’t matter how many turns they get, it all depends on if they entertain Ginis. Yamato and Amu find the couple as they get off the bus. Yamato asks about the cube and the guy says he found it on a recent trip. Amu asks to see and the girl is more than happy to just give it to them. The boyfriend gave it to her as a gift, but she says she doesn’t want it and was going to throw it out anyway. The girl looks for it in her bag, but realizes she left it on the bus. Yamato and Amu hop on and find the cube. Amu notices it’s smaller than the King’s Marks they have. Yamato says he’s sorry it’s not it, but Amu says there’s no need to be sad. She wants to return to Zyuland, but since that’s a tall order, she’s ready to get used to the human world. Bowguns sets his sights on the bus Yamato and Amu are in. Amu’s tail stands as Bowguns fires at the car behind them. The others have found Bowguns and follow him as he jumps onto the bus. But Bowguns fires and stops them in their tracks. Yamato henshins and takes on Bowguns on the roof. Yamato almost falls off, but gets his wings and attacks from the sky with Amu helping by shooting up through the roof. He knocks Bowguns off the bus and Amu jumps out of the bus, but rolls down the hill. Yamato makes sure Amu is okay as the others arrive. Leo asks why they didn’t show up earlier, but Amu shows him how to use the cube as a phone. Bowguns pops up again and they all henshin. 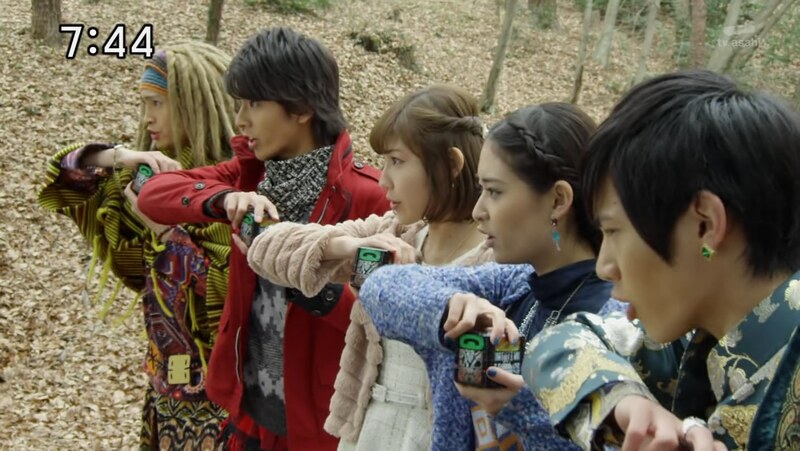 Bowguns summons some Moebas, but the Zyuohgers easily take care of them. Bowguns continues firing arrows so fast the Zyuohgers can’t block them. Except for Yamato who is able to see the quick moving arrows. Amu realizes Yamato’s eyesight has awakened, just like earlier. Eagle eyes! The Zyuohgers unleash the beast and finish off Bowguns’ first life. Nalia heads down with a Continue and Bowguns embiggens. The Zyuohgers hop into their cubes, but Bowguns fires at the mountains and buries Amu and Tusk under rocks. The others form ZyuohKing. 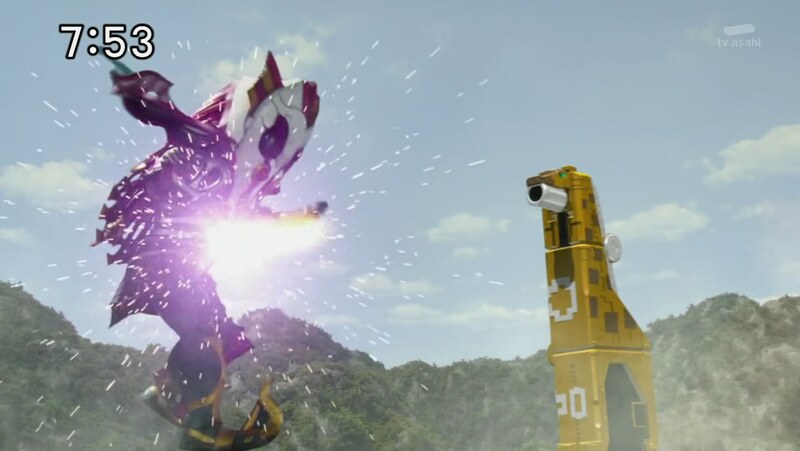 Bowguns again fires at the mountain and buries ZyuohKing up to its waist. 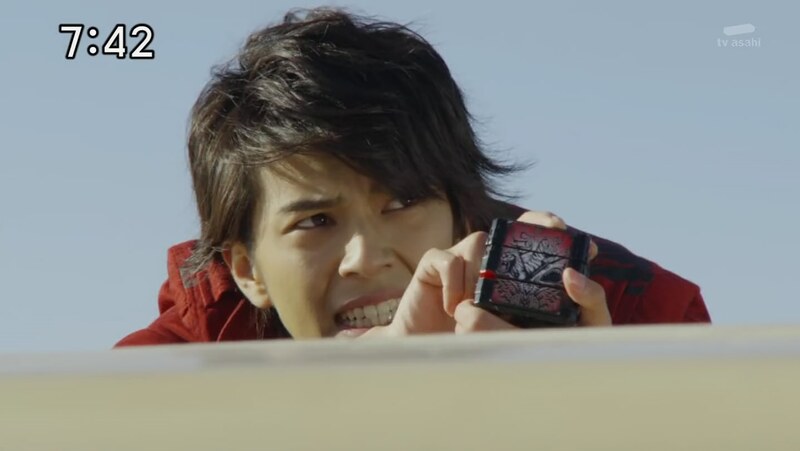 Just then, Amu and Tusk break out of the boulders and give Yamato a chance to separate his cube from ZyuohKing. Yamato, Amu and Tusk then combine. Suddenly, the cube they got from the couple earlier changes. Yamato figures it’s not a King’s Mark, but it is still from Zyuland. 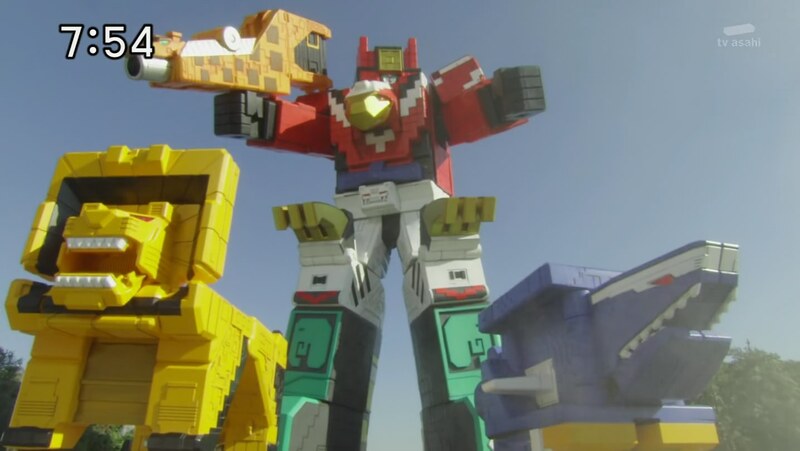 The yellow cube flies out of ZyuohKing and it turns out to be a big giraffe. Cube Kirin can turn into a bazooka and with it, they are able to finish off Bowguns. 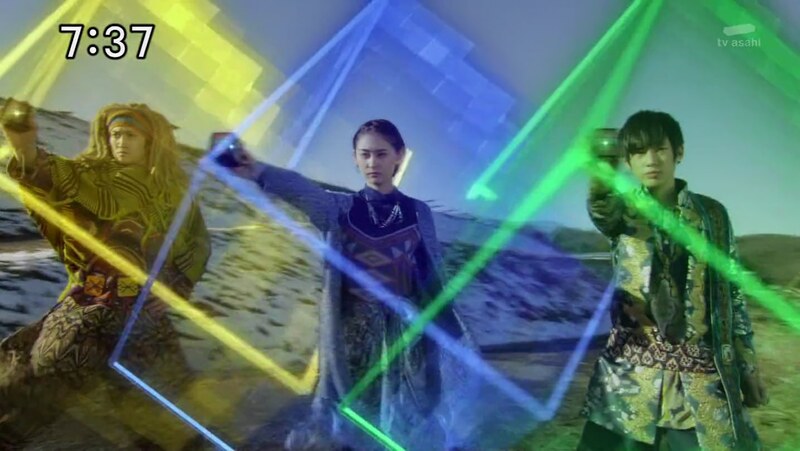 Back at the tree house, the Zyuohgers realize there are ZyuohCubes in the human world too. They truly all are linked. Uncle Mario introduces Amu to the vacuum and she loves it. Amu is still a little pessimistic about being able to return to Zyuland, so Yamato has a compromise. How about they continue searching for the King’s Mark, but also have the Zyuman4 still learning about the human world. First lesson, Yamato will teach the Zyumans how to do the housework. A good episode. I think it was a little more fun than last week’s. I was legit surprised that the small cube turned out to be a Zyuoh Cube. I don’t follow any of the toy news, so I have no idea what kinds of new mecha will pop up. Speaking of, I expect all five cubes to combine soon of course. But at least in this episode, we got to hear the drum roll twice! Very fun. And it was also a creative way to get the two cubes out of the equation instead of them just racing to the sky squares. The fight choreography when they were taking on the Moebas was awesome. Blowguns’ design was nice. And that poor boyfriend with the unappreciative girlfriend was funny. It’s interesting to see the Zyuman4 just walking around with their tails hanging out. Not one person thought it was weird. And that in itself is kinda awkward. So hopefully we’ll get to see a little more fish out of water stories (sorry Sela lol) with stuff like the Zyuman4 discovering human things or humans noticing them being different. ← Recap: Power Rangers Dino (Super) Charge, Episode (5) 25 – "There is nothing to talk about." I don’t think that the people who left the cube on the bus, I think that they might be siblings because the man said “I’m going to tell mom on you” I don’t know. Anyway it is a good episode and it shown that Amu isn’t a ditsy girl like Fuuka and Kagura, this episode shown that Amu is smarter then she looks. And it also shows a little possibly of Leo and Amu being best friends because he didn’t get mad at her. I meant I don’t that the people who left the cube on the bus are a couple.